It was time for some girl power and who better than the X-men's Rogue? 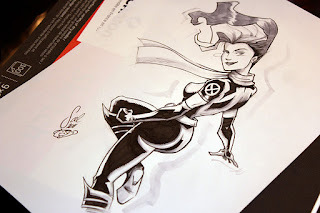 For those of you who aren't familiar with Rogue, she's one of the X-men and was featured in the last trilogy of movies starring Anna Paquin (HBO's True Blood). She's one of the strongest members of the X-men. She's able to take on another mutant's powers temporarily (and can knock out normal people), by making skin on skin contact for a moment. But she is cursed because she can never truly touch people for fear of killing them if she holds on too long. Some of you expressed that you don't like the bad guys, well Rogue started off as a villain and found redemption with the X-men, so there. I went with her current costume in the comics, but made some minor changes. If you'd like to win this sketch for $1, just leave the first comment, make sure you're subscribed to this blog and good luck!